This picture, this perspective has never been done before and what an amazing view it is. Some of my perspectives I plan months in advance, I try to visualise perspectives, angles and situations, which means it can sometimes be very annoying when they are copied almost instantly and the copiers take all the praise for how creative they are. This is one photo that I have had in my mind since last year and I am sure someone will copy it soon enough. Its a perspective that can only really work at Christmas time and I think it’s a “cracker”, I hope you do too. 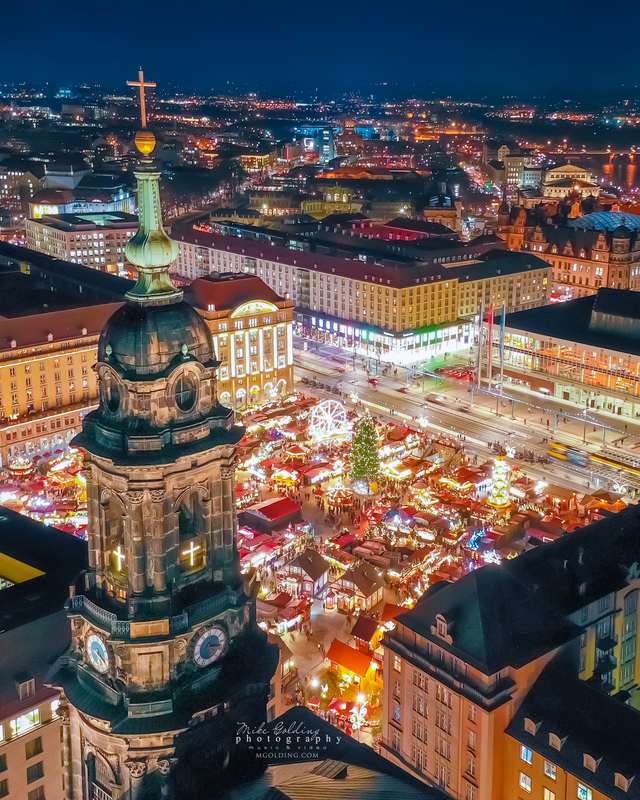 This is a view of the Kreuzkirche and the Striezelmarkt (the world oldest and original Christmas market), in the background its possible to see some of Dresden’s other most famous landmarks, the Zwinger, the Semperoper, the Residenzschloss, hope you like it… please follow me on Instagram if you want more like this !